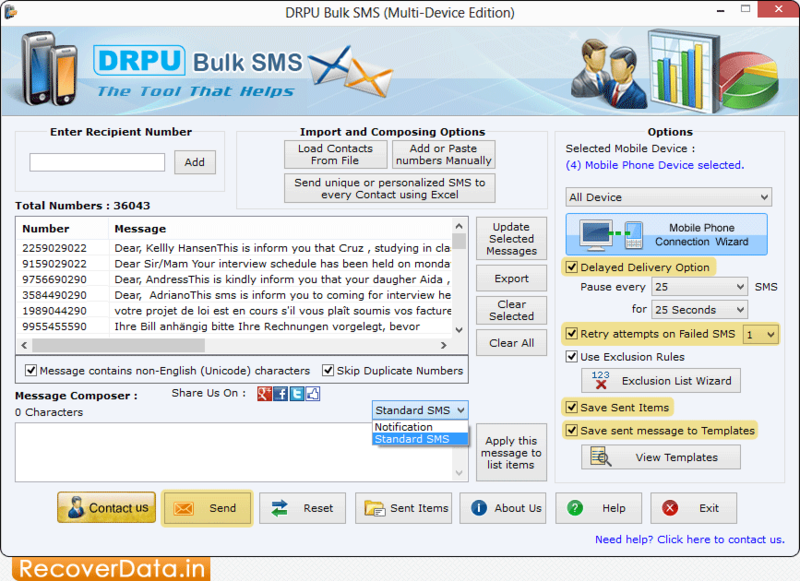 Bulk SMS (Multi-Device Edition) allows users to send thousands of text messages using GSM mobiles connected with PC. Now you can easily send bulk messages from PC to different mobile contacts via GSM technology based cell phones without any internet connectivity. 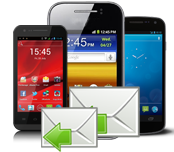 You can connect multiple GSM mobile phones with your computer to deliver bulk messages instantly using advanced Mobile Text Messaging application. Bulk SMS program helps you to broadcast SMS to your friends, relatives, clients and business partners over world wide location. Software provides inbuilt list Wizard option to maintain the list of contact numbers. SMS Broadcasting program supports all brands of GSM technology based cell phones including Samsung, Nokia, Motorola and many more. Send group messages via GSM based mobile phones connected to PC. Inbuilt list Wizard option to maintain list of contact numbers. Users can send text messages in English as well as Non-English characters. Provides facility to skip duplicate number entries. Delayed Delivery option to control the load of SMS broadcasting. Does not require any technical skill to operate the software.